This is a real paradise for bikers and history enthusiasts, who want to experience the great adventure in one of the most suggestive kingdoms of nature. Get on a bike … or just go for a walk on the fresh air, enjoying leisurely a miracles, among which you move. Bike is a perfect form of transport in a place where time seems to have stopped at the foot of The Nuraghe, archaeological troves and monuments of nature. Here everything is a priceless heritage! The trial is accessible for both: experienced travelers and amateurs, is shaped like a loop, so it could be travel in both directions. 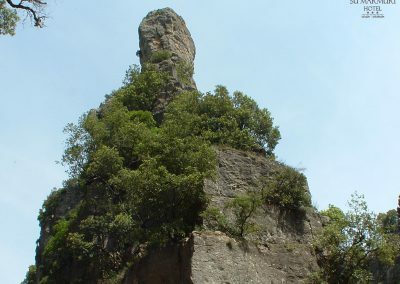 The tour begins at the foot of the magnificent nature monument – it is so called Scala di San Giorgio, the pass is situated on the territory of Osini. “Scala” is a term, which the local population defines the pass between the steep rocks. In this case it is a very narrow passage, through which runs the asphalt road leading to a nearby the center of Osini. 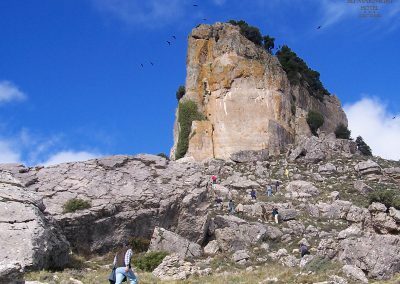 The pass developed of a series of vertical cracks in rock massifs. One of these cracks, commonly known as “Sa Brecca ‘e Usala”, is very impressive. The vertical cut extends through the entire western part of the pass, reaching a staggering height of almost 100 meters. Those who would like to look at it and not to embrace the speleological techniques, we recommend either climb the stairs to the lateral chasm, and either walk into designated path to the top of the rock. Interestingly, crossing this pass, you can feel the gust of wind at a constant temperature of 9 degrees. In winter, this phenomenon does not occur. The extraordinary, majestic mountain pass has a great impression thanks to the dizzy heights of rocks, and a little distance between them. Vertical measures more than 50 meters! After climbing upwards the stairs the path, you are at beautiful view point, located on the east wall of the massif. 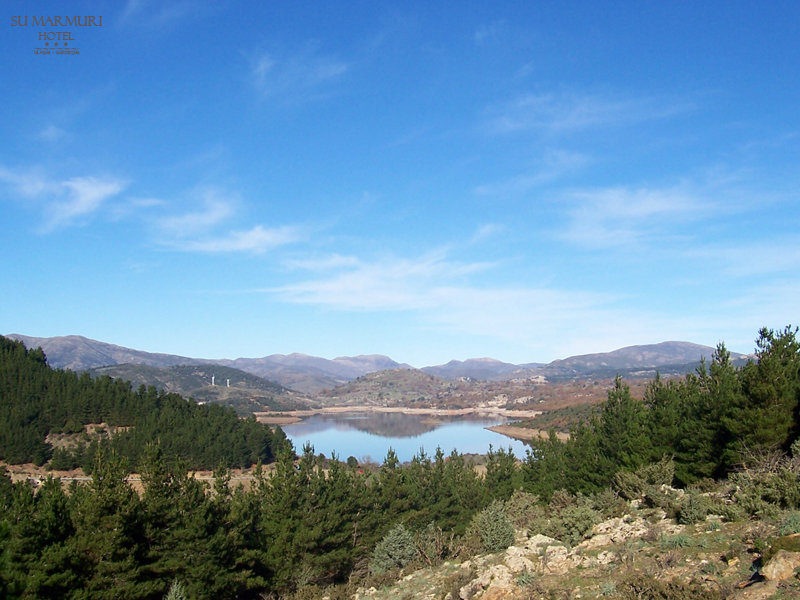 Here you can admire another monument of nature – a vast valley of the Pardue River, extending pastures, forests, fields and small settlements until to the sea on the horizon. It is easy to see the historic village Osini and Gairo that after the Second World War, as a result of landfall locality depopulated, and it remains empty, although it was restored and partially opened to public. Legend says that the pass “Scala di San Giorgio” is the result of a miracle, which made the saint Bishop Suelli. Giorgio – because that was his name – one day at twilight stopped on his way to Seui at the foot of the ascendant over Ossini rock massifs. 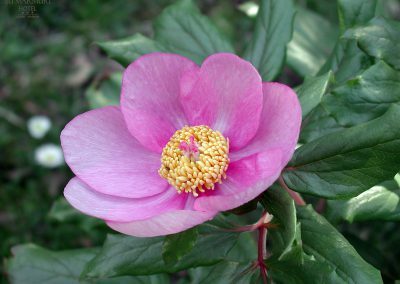 Not being able to cross through it, he raised his eyes to heaven and prayed, and then ordered the calcareous rocks to divide paving him the way to the center Osini. 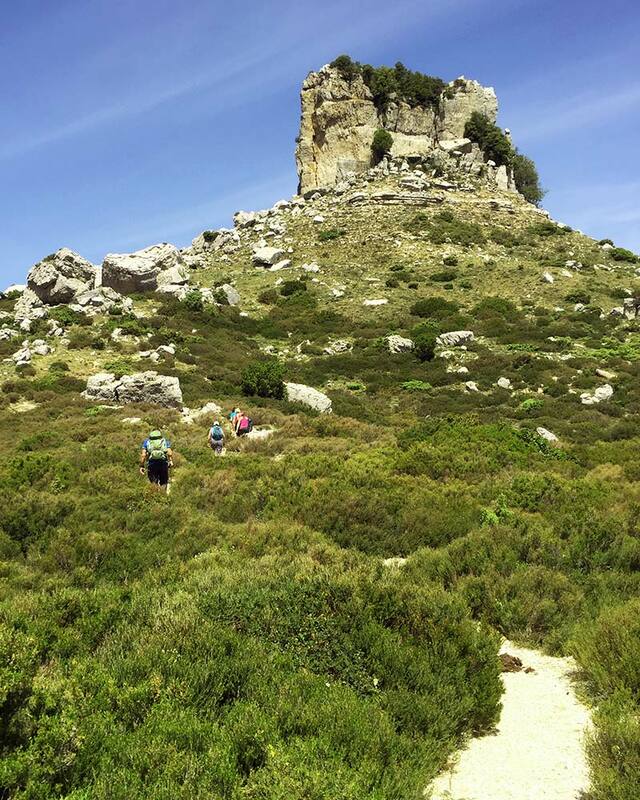 Bishop also caused that out of the rocks would flow in a miraculous way – to cheer walkers – a source of refreshing water, which supposedly had miraculous features. On the rock in front of the past is set a modest size statue commemorating the saint. It is worth to look at the huge rock blocks, which partially collapsed – whether in the distant past or recently. The area where this occurred is located on a hill. To this day it is called “Su Casteddu”. The term derives from the folk tradition, according to which in this area once rose ancient fortress. Just behind the tourist information you can still see the ruins of the Punic sanctuary. Those, who move to the north in the opposite direction to the clockwise reach Punta Su Scrau Massif (1032 meters). 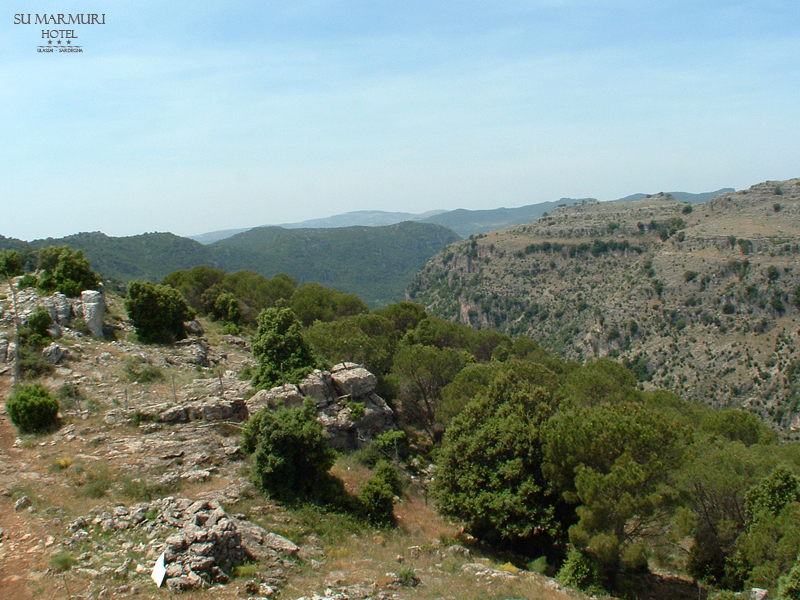 It is an excellent vantage point where you can admire the extraordinary countryside. You also find an observation tower, on which an unusual architecture we suggest you pay close attention. Lead down path takes you to a junction: going to the right, after only 10 meters you encounter signpost. Go in the indicated direction, and you enjoy of view more spectacular objects: Perdu Cuccu and Is Arenas. The soothing tranquility of the place and the view of extending valleys in the bottom, in where live bighorn sheep once again make that you wish to break a hike and enjoy the beauty of the area. A little further waits for you the most beautiful and best preserved Nuraghes complex in Ogliastra. This is so-called. 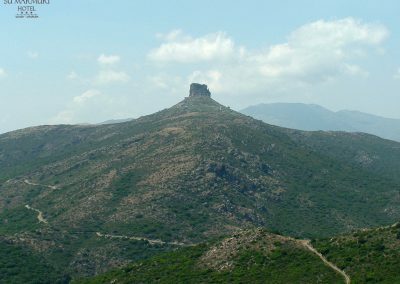 Nuraghe Serbissi, soars in its majesty over the surroundings. 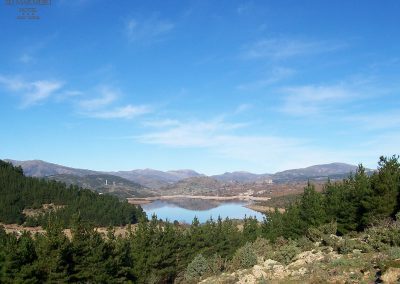 View is breathtaking: on the north dominates the Gennargentu mountain chain and with it the nearby Perda e Liana – another natural monument, located in the village Gairo. 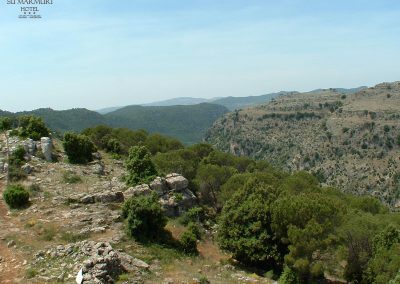 On the south hills and mountains extend to the horizon. The Nuraghes complex consists of central tower, and three smaller towers. One of them is situated towards to the north, the other to the south, and the third to the west. They are connected brick bastion .The central tower reaches a height of 6 meters, and its diameter up to 10 meters. There is a cave at the foot of ancient structure, about 20 meters below. It is a natural tunnel, allowing access (from north to south or vice versa) through the hill on which is located nuraghe. The grotto is a large, though not enormous, visitors are advised to equip a torch. In times past it probably was used as a shelter and to store food supplies. Shepherds have recently used it such a purpose: sheltered there with cattle. A bit lower is so called Tomb of the Giants, and near it a spring. In the cave and its surroundings – as well as in other nuraghes – found, among others, fragments of pottery. Let us return to our journey. Following the path to the south, you reach another impressive cave, which is worth visiting – a cave Su Lioni. From here overlooks the valley Gairo Taquisara. In the valley is located station, so it is not impossible that you will see a speeding Green Train. It can even hear the whistle! Continuing the journey paved path, you reach the second tower. 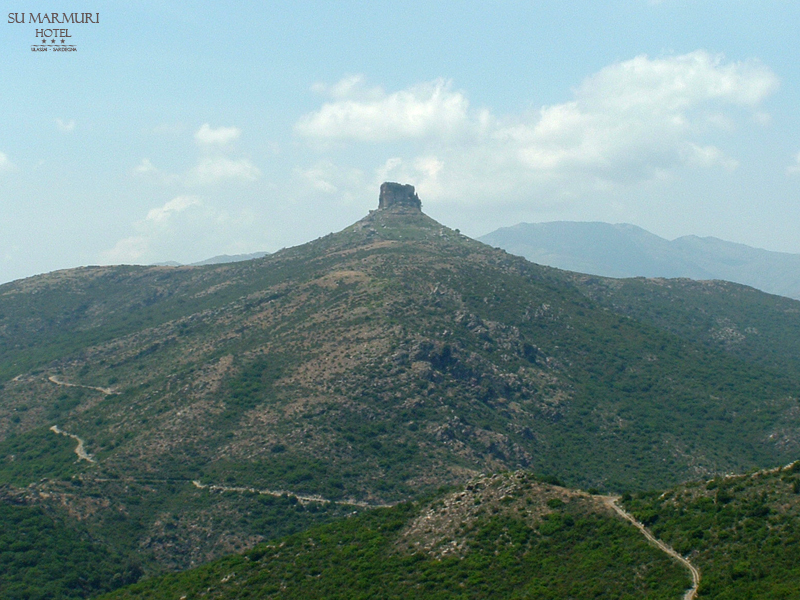 It is so called Nuraghe Urceni. 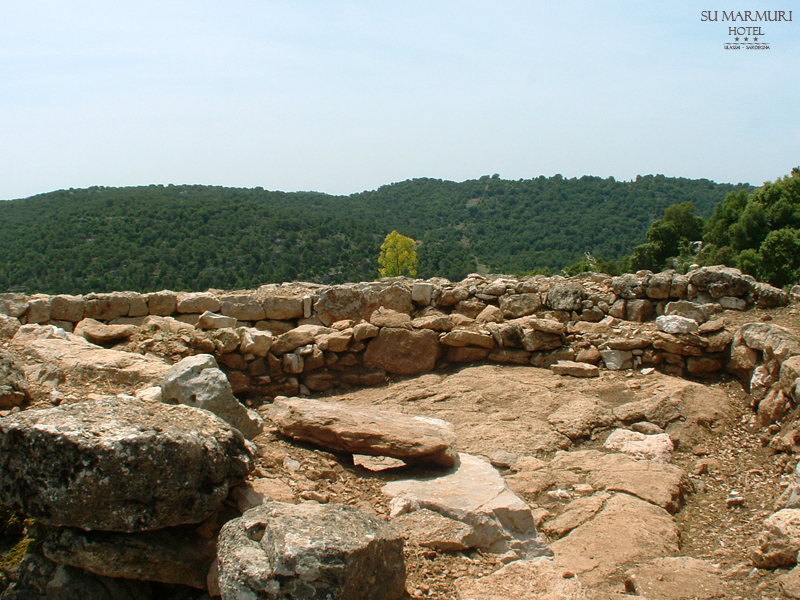 The complex consists of circular nuraghe and other buildings, surrounded by high walls. Nuraghe, built with only one tower, is comparatively well preserved, although tholos crowning it collapsed almost completely. In good condition are also impressive, forged in a stone wall the stairs leading to the floor or a terrace. Most striking are the huge front door, however, much higher than the average door, which – if we take into account the modest size of nuraga – is a peculiar phenomenon. Another peculiarity is the location of the building: it rises on the rock, several meters above the abyss! Behind nuraghe are numerous round structures, some of them are preserved in excellent condition. In their walls forged niches. The complex is surrounded by tall, well-preserved wall. Passage leads inside. From this place the trial run down and goes straight to the source so called Funtana Urceni. Nearby are the ruins of Roman settlement. Going forward, you get to the so called Taccu, where you can partake and take advantage of other services. Then the asphalt road leads you to two other notable nuraghe. 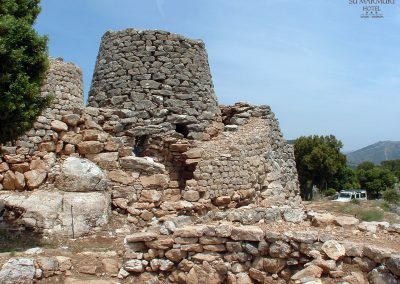 The first, Nuraghe Sanu, consists of only one tower, and is relatively well preserved, but here the ruins of the dome to prevent entrance inside. Nearby are two Tombs of the Giants, but both survived only in the lower part of the stone wall – both in the burial chamber, as well as on the facade. 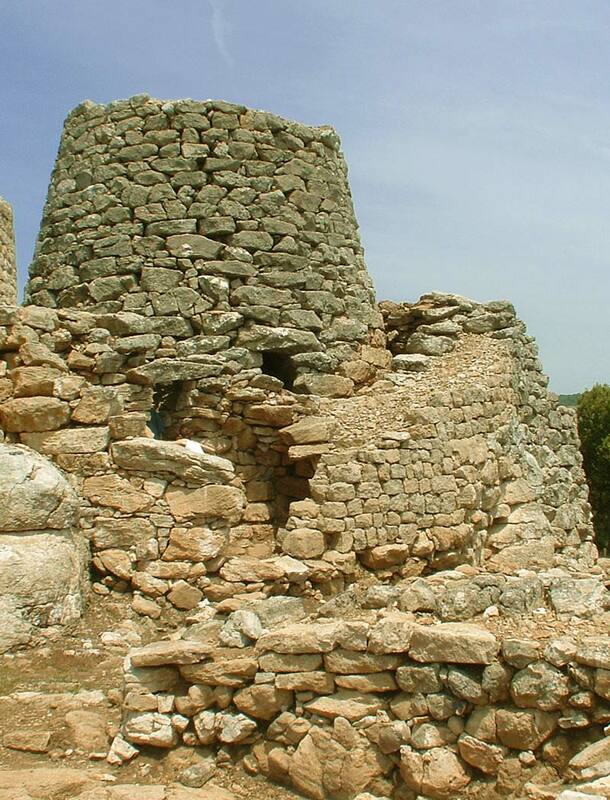 A little further on stands the Nuraghe Oruttu, consisting of one tower and kept in poor condition. The walls almost completely turned into ruins, rubble filled inside. Hike ends back to the pass Scala di San Giorgio.